Have you ever had a “tried and true” glaze that usually looks the same, but then sometimes it comes out looking different? A clear glaze that goes cloudy when thick? A glaze that runs sometimes, but not always? A finicky glaze that never turns out the same? The art of glazing can keep us on our toes. Nerves are high as we wait for the kiln to cool. Will our glazes look beautiful? Or will they be a disaster? We open the kiln to discover what’s inside. Some kiln openings are cause for celebration, others make us want to give up. Why can’t our glazes just work the way we want them to? Why does glazing have to be so complicated? There’s no shame in that. The struggle is real. We’ve all been there. When something feels out of our control, it can be less enjoyable. Did you know that the physical thickness of your glaze plays a major role in the fired appearance? A glaze might have a lot of depth and variation when thick, but appear completely flat and uniform when thin. Some glazes turn out a completely different colour when thick vs thin. When layering glazes, the thickness of each glaze in the combination will influence the end result. Certain glazes work best when thick and others are best when thin. There's no right or wrong answer to how thick a glaze should be. This is an artistic decision you can make based on your own aesthetic preferences. But even when you know how you like your glazes best, the tricky part is often repeating results firing after firing. This is where my course will help you. How much water do you add to your glazes? Do you have a way of measuring how much water you're adding to your glazes? Or do you just add water until it seems right in the bucket? That's what I used to do. It seemed simple enough until I started getting different results every time I glazed. The amount of water we add to our glazes has a big impact on how our glaze will apply to our bisque. When the water content is consistent, it's more likely that our application thickness will also be consistent. By measuring the SPECIFIC GRAVITY of our glazes, we can see the exact ratio of solid glaze particles to water in our glaze bucket. This gives us an objective look at the water content of our glazes, no opinions required. You can check the specific gravity at any time. You don't need to know how much water you started with. Specific gravity is measured by weighing a volume of glaze. This course will cover all the steps for measuring specific gravity. I will show you different tools and equipment you can use. When a glaze comes out of the kiln looking perfect, we can record the specific gravity number. Then it's easy to make sure that glaze has the same amount of water every time we use it. Specific Gravity also gives us a reference point to make adjustments if our results are too thin or too thick. The first step to controlling glaze thickness for consistent results is to control the WATER content of our glazes by measuring SPECIFIC GRAVITY. When we have a glaze that's too thick, the natural response is to add water. If a glaze is too thin, we might attempt to remove some water. But did you know that water isn't the only factor that affects the thickness of our glazes? 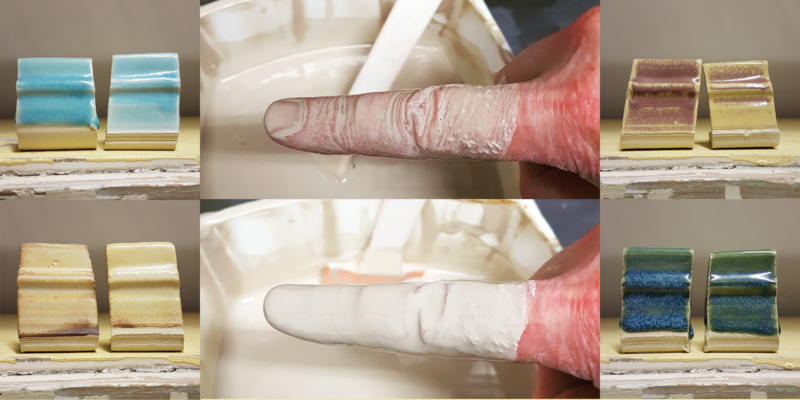 There's a concept called FLOCCULATION/DEFLOCCULATION that changes the way the clay particles in our glazes interact with each other and alters the VISCOSITY, or physical thickness of glaze. Adding and removing water aren't the only ways to thin or thicken a glaze. There are scenarios where you'll want to keep adding water, even when it's already too thin. Then we can flocculate the glaze to thicken it back up. There are also scenarios where adding water to a thick glaze will cause problems like cracking/crawling. Instead, we can deflocculate the glaze,to thin it down. Flocculating and deflocculating are ways of changing the viscosity of our glazes in the bucket, without adjusting the water content. The second step to controlling glaze thickness for consistent results is to adjust the VISCOSITY by FLOCCULATING or DEFLOCCULATING as required. By keeping your water content and viscosity consistent, your fired results will improve. When there are less variables, it's much easier to fine tune your glazing process and get your glazes looking how you want them on a regular basis. Many glaze issues can be improved by adjusting glaze thickness. If you've experienced any of these glaze problems, measuring your specific gravity could help you solve them. The course is split into 6 modules. Each module contains several short video lessons. This course will be released in 2 parts. The first part covers the WHAT and WHY of Specific Gravity and Flocculation. The second part covers HOW to use these techniques in your studio. Once all videos are released, you'll have ongoing access to them and all future updates. Choose to take this course in a group with other ceramic artists and support from Sue, or choose to take this course independently. Join fellow ceramic artists and learn from each other as you complete the course together. Receive guidance from Sue by way of a private discussion forum and weekly live Q&A sessions. I'm a complete beginner, will this course be useful to me? Yes! This course will help you develop great glaze habits right from the get go. If parts of the course seem too advanced, just take in what you can and then you can always come back and re-watch it later. You will probably learn something new every time you take the course. I use commercial glazes. Will this course be useful to me? If you ever add water to your glazes, this course will help you. You can measure the specific gravity of commercial glazes just like any other glaze. Since their composition is unknown, they may react unexpectedly to flocculants or deflocculants. Always test with a small amount of glaze. I don't have time to take a course right now. Will you be offering it again soon? Since you get forever access to the course content, plus future updates, you can sign up now and watch the videos whenever you're ready. I do plan to run this course again in the future but the date is uncertain. No refunds will be given after the course begins on Apr 8. Be sure to read the course outline before purchasing. If I do the Guided Group Program, can I still email you questions about the class? Private support will not be provided about course content. All questions will be answered in one of the online discussion forums. There's the private 'students only' Facebook group, or if you're not on Facebook, there will also be a discussion section on the course site. Those are the 2 places I'll be answering questions about course content, plus there's the 3 live Q&A sessions. How do the live Q&A sessions work? These will be live video chats where we can all get on camera together and discuss the course topics. You can use your webcam or mobile device camera to participate, or just type your questions in the chat. If you want to show me something in your studio, no problem! Technology these days makes it so easy to teach and learn from afar. Everyone will have an opportunity to ask me their specific questions and you will also benefit by hearing me answer other people's questions. What if I'm unable to make it to the live Q&A sessions? There will be an opportunity for you to pre-submit your questions before the session and I'll answer them live during the meeting. All of the Q&A sessions will be recorded and added to the course so you can watch them any time you like. They are designed to help you whether you can attend live or not. If I do the DIY Program, can I still email you questions about the class? Private support will not be provided about class content. Please join my free Facebook group - "Understanding Glazes with Sue" for discussions on all glaze topics, including the topics of this course. Link to Free FB Group is at the top of the page. What if I sign up for the DIY Program and change my mind and want to switch to the Guided Group program? No problem, just let me know and I'll give you a link to upgrade. You'll want to decide before Apr 12, which is when the first live Q&A session takes place. If I do the DIY program now, can I join the Guided Group next time you launch the course? Yes! Each time I launch the course, I will offer an upgrade option for those who only got access to the videos in the past. You will pay whatever the difference between the DIY and Guided Group programs are, at that time. Sue is a studio potter from Victoria, BC, Canada. 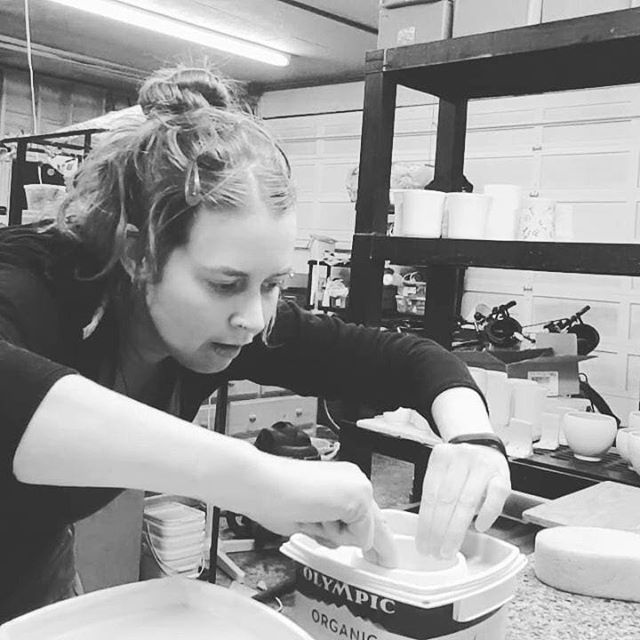 She has been the ceramics studio technician at a community studio since 2015 and has been teaching workshops on ceramic glaze chemistry since 2017. ~~~ Sue presented on a panel discussion about ceramic glazes at the 2018 NCECA conference in Pittsburgh. She gave a talk called Understanding Cone 6 Glazes. ~~~ Sue received a diploma in Clay from Kootenay School of the Arts in 2010, which is when her love of glazes began. Between 2014 and 2017 she took online clay and glaze chemistry courses through Alfred University. ~~~ Sue continues to expand her knowledge of glazes with ongoing tests and experiments. I'm excited to work with you and help you take control of your glaze application and fine tune your glazing process. Joining this program is your first step to more consistent glaze results.